Alissa Wild is on the front lines. On a daily basis she’s witness to the continued permeation of additive manufacturing (AM) into industry, and the reluctance of some in the industry to make that leap. For some, AM is a threat to business. Can metal parts be taken from the presses, cutting machines and other metalforming equipment and instead be produced via printing? Not in the quantities and cycle times demanded by many customers, certainly not in the foreseeable future. Equipment and material costs, combined with the need for extensive post-processing to meet precision tolerances and yield acceptable surface finishes, all argue against a replacement of traditional stamping and fabricating processes. On the other hand, by shifting perspectives, AM can be viewed as an essential tool in many manufacturing operations. The examples are many. Automotive OEMs and their tier suppliers use fused deposition modeling (FDM, an AM process where filament is heated to a molten state and deposited in layers to build a part) to produce assembly fixtures. The U.S. Navy’s repair facilities, Fleet Readiness Centers including FRC East and FRC West, actually use FDM tooling when forming limited-quantity parts in runs from one to 500. End-of arm robotic tooling is another common application noted by Wild. Time savings is a big factor when deciding to implement AM, according to Wild. This large inspection tool, more than 3 ft. long and made from thermoplastic material, was designed, printed and delivered to an automotive supplier within one week—a fraction of the time as would be required for a traditional metal tool. For end-of-arm robotic tooling, in some cases, FDM tooling can be a one-to-one replacement, which is true in other workholding applications as well. “If you are simply using a nest or cradle to hold a part during a particular operation, an AM-created part may replace the traditional machined resin block,” says Wild. “You may even be able to use the same CAD design. In these cases, AM can help produce what Wild calls “hybrid fixtures,” which include, for example, hard contact points for a drill guide. Experiencing a pain point typically signifies the entrance of manufacturers into the AM realm, according to Wild. A check tool for stamped automotive seat brackets required a lifetime of 42,000 inspections. The previous tool, constructed via traditional subtractive-manufacturing processes, weighed more than 40 lb. The redesigned thermoplastic 3D-printed tool weighs only 4 lb., with delivery time cut from six to two weeks. Its user reports that the smaller-profile tool enables improved part alignment. The best time to explore AM is prior to having to respond to these pain points, when more thorough research can be performed. In doing such research, you may find all sorts of potential AM applications in your operation. “We’ve seen it in automotive companies, starting with a safety or ergonomics issue where someone has to lift a tool off of a shelf and carry it back and forth to a workstation two or three times a day,” says Wild. In one case, relays Wild, Solaxis Ingenious Manufacturing in Bromont, Canada, using Fortus 3D printers from Stratasys, designed and manufactured a jig for an automotive supplier, which uses it to assemble high-volume door components. After developing several iterations of the jig, Solaxis not only was able to produce a 3D-printed jig that is more than 100 lb. lighter than a typical jig for this application (the 3D-printed jig weighs 28 lb. ), but it also slashed design and manufacturing time by at least two-thirds as compared with traditional methods, according to Solaxis officials. Another example: TS Tech, in supporting its stamping operations, switched to 3D printing to produce a seat-bracket check tool. 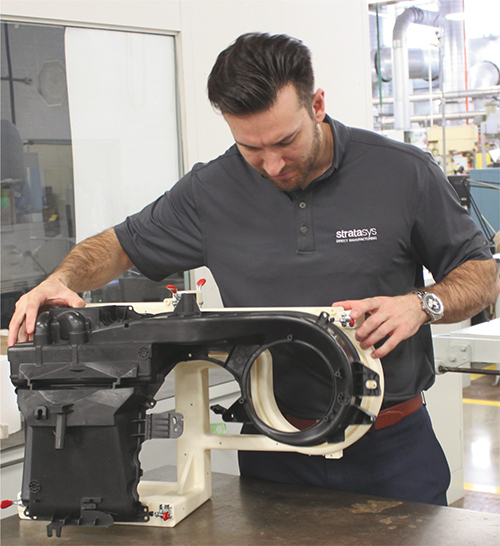 Stratasys Direct Manufacturing redesigned and produced the tool, which featured a weight reduction from 40 to 4 lb. with a production-time reduction from six to two weeks. The new tool not only had a smaller profile, but it provided better part alignment and was easier to transport than the inspection tool it replaced. And, report TS Tech officials, it was tough enough to withstand the needed 42,000-inspections lifetime. 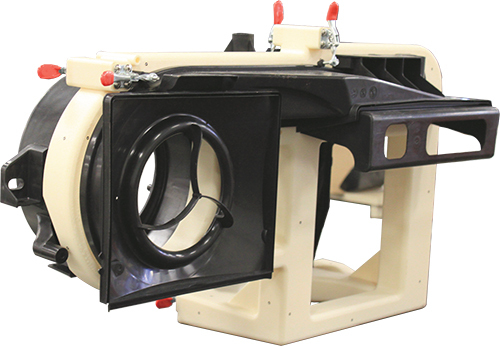 Oreck Manufacturing, according to Wild, is another convert to 3D printing, using the process to create custom assembly fixtures for its high-end commercial vacuum cleaners. According to Oreck’s senior model maker, the company has reduced fixture-production costs by 65 percent by using its inhouse FDM 3D printers. Oreck has used AM to make hundreds of inspection fixtures for its CMMs. On average, it saves $200 and 6.5 days versus having them machined. Join the Precision Metalforming Association and MetalForming magazine on September 7 in Cleveland, OH, for a day of presentations on what metalformers and fabricators need to know about 3D printing for jigs, fixtures and prototypes. 3D printing allows for customization of end-of-arm and workholding tooling and devices, test-fixture components, and more. Unlike conventional manufacturing, 3D printing handles design complexity with ease, and without adding cost or time. And, the flexibility of 3D printing allows metalformers and fabricators to readily optimize their products to perform specific tasks. Join us for this informative day of presentations, and come away with a deep understanding of the various types of printing processes, materials and techniques you can use to improve your design and production of jigs, fixtures and prototypes. Before employing AM, Oreck took 30 days to complete its first-article inspections of 20 to 30 components for a new product. After receiving the first samples from production tooling, the QA department would start making fixtures and programming the coordinate measuring machine (CMM). On the 30th day, it would complete the CMM inspection and release the program to the production floor. With inhouse 3D printing, the company can quickly begin producing fixtures via its 3D printers and begin CMM programming when a tooling order is released, not after samples are received. As a result, the Quality Assurance department is ready and waiting for the arrival of the first samples. The company estimates that it can save $100,000 to $500,000 annually in such wait-time reductions. Nonmetal AM has proven successful not only as a method to manufacture jigs and fixtures, but for metalforming tools as well. This often happens when metalformers need to prove out tooling, can’t wait for traditional tool-build methods or see the benefits of economical low-volume production. 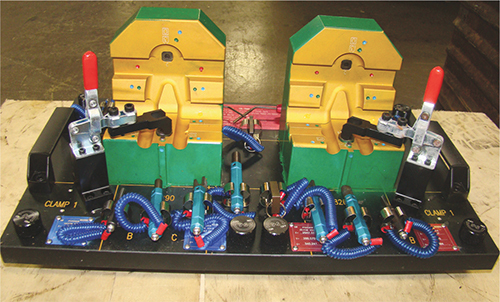 Hydroforming and stretchforming, notes Wild, are two proven applications for tooling, including punches, pressure intensifiers, matched male and female tools, and back-filled tools. In tests by Stratasys with industry partners, Wild reports success in using Ultem 9085 or Nylon 12CF on Stratasys Fortus 3D-printing systems to produce low-volume or bridge tooling in forming applications. These tools, she says, have been validated for forming pressures to 15 ksi in runs to 100-plus parts. FDM was used to produce a 10 by 13 by 2.5-in. stretchforming tool with multiple contours, made with Ultem 9085 material. The tool, according to Wild, successfully formed an aluminum alloy, 2024-0, in thicknesses from 0.050 to 0.100 in. This is an optimal application, she says, because surface pressures are minimal, and the tool can be easily optimized to minimize build times and cost. The same material with FDM was employed to produce insert tooling in a tube-hydroforming application. With internal pressure ranging from 3 to 15 ksi, the tooling formed 16-gauge 1008 carbon steel, as a 2-in.-dia. tube, in 13 forming cycles. This tooling is best-suited for minimal-deformation operations, reports Wild. High-deformation operations would require consideration of localized stress concentrations. And, for rapid repairs, The U.S. Navy has employed the FDM AM process to produce a variety of simple polycarbonate forming tools. Navy officials say the process has allowed for the return of aircraft to service (after part fractures due to hard carrier landings, for example) in a fraction of the time as compared to traditional tool-and-part-production processes. Again, across all of these examples, printed tooling yields significant lead-time savings as well as customized and economical low-volume production. Important factors to consider when researching the resin-tooling route: forming pressures, quantity of parts needed and type/thickness of the metal to be formed. Okay, so all of the above has convinced you that AM can serve valuable functions in your operations. What now? “The AM landscape is dotted with organizations to help you travel the 3D-printing path,” says Wild. “An example is Stratasys’ Expert Services Group, which can create CAD designs and perform other services. It can take your file of a fixture or tool, redesign it for AM and even build it while walking you through the entire process. Service bureaus also can build fixtures and tools that you design if you have that capability (Stratasys Direct Manufacturing offers this service). Where and how is the tool/fixture used? What are the critical tool/fixture features and functions? Will the tool/fixture be in the presence of chemicals and solvents? Answers to these questions provide guidance on the proper materials and build processes to employ. Theoretically, AM fixtures and tooling are not limited by size. Even though printers may have build chambers measuring 3 by 2 by 3 ft., by sectioning and then bonding the sections together, much larger fixtures and tools can be constructed. Wild notes that, through sectioning and bonding, Stratasys has produced forming tools surpassing 8 ft. in length. But, she cautions, the limiting factor is accuracy. The goal of this article was to provide insight into AM, and how it can be a friend to metalformers, fabricators, and tool designers and builders. With a discerning eye and some knowledge of the process, my bet is that you readily can find AM applications in your operations. You’ll be surprised by how much AM can help…and in unexpected ways, as this last example illustrates.